Click here to listen to new episodes of Fibber McGee & Molly! There are people who would argue that Fibber McGee and Molly were the Golden Age of radio. This is partly because of the show's very long (1935-1959) and successful run. But more than just staying power, the show showcased terrific comic and musical talent. Throughout its run, the show was a reflection of its time in the American scene. The genesis of the program can be traced to a local Chicago show that would become Smackout. 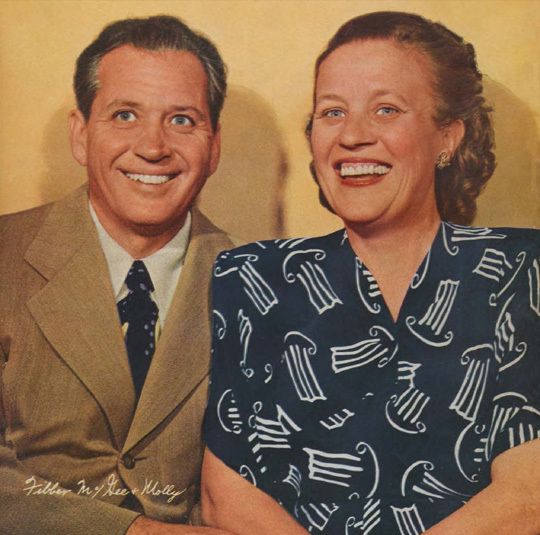 Fibber McGee and Molly would go on to great success despite (or perhaps because of) the vaudeville sensibilities of its creators and stars, married couple Jim and Marian Jordan. Living in the fictional Midwestern city of Wistful Vista, Fibber was an American teller of tall tales and a braggart, usually to the exasperation of his long suffering wife Molly. Life in Wistful Vista followed a well developed formula, but was always fresh. Fibber's weekly schemes would be interrupted, inspired by, and often played upon the People of Wistful Vista, a set of regular players and characters that were as beloved as the stars of the program. The program used a series of running gags that would become part of the common language, many treasures can be found in the Closet at 79 Wistful Vista. The show began as a comic reflection of Depression Era America, but as time went on and the shadows of war came over the nation, the show again caught the mood of the country. WWII was fought on the Home front on Wistful Vista as surely as anywhere else in America, but here they had the benefit of Fibber's somewhat addled perspective. 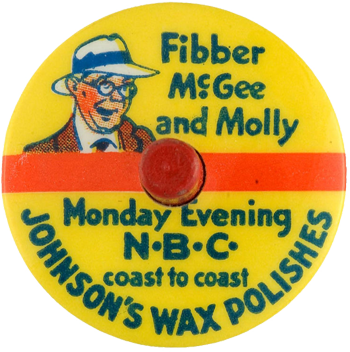 The show was formally "The Johnson Wax show with Fibber McGee and Molly." Longtime sponsor S.C. Johnson Wax Company saw the value of saving the episodes they sponsored, thereby preserving this treasure for fans of Old Time Radio today.